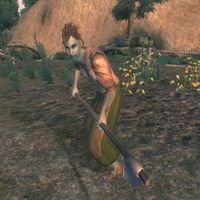 Undena Orethi is a Dunmer farmer living in Skingrad who is obsessed with finding the perfect tomato. She owns Cyrodiil's largest tomato farm, located northeast of town. Undena spends most of her time standing next to a rock by the Gold Road. At midday she tries to eat lunch for two hours, still out in the open, although she doesn't have any food on her person meaning that she will simply stand around doing nothing unless a kindly soul drops food nearby. She then continues standing by the rock until 6pm when she will head back to her house for dinner. She will then go back to standing by the rock again at 8pm, all through the night and all through the day until 6pm. She wears a lower-class outfit consisting of coarse linen shirt, green felt linens, and huntsman moccasins. She also carries her house key and a small amount of gold. When greeted for the first time she will say "A perfect tomato... one taste, and it is gone forever. And then... a lifetime of searching for the next one. Undena Orethi. I am a pilgrim in search of the perfect tomato. It is my grail, and I shall follow it all my life." It seems she came to Skingrad for its ideal tomato-growing soil: "You wouldn't think it, but our rocky soil is perfect for tomatoes. The same ground that produces our glorious wines produces my splendid tomatoes." Many of Skingrad's citizens appreciate her efforts, and will tell you that "Undena Orethi has got some fine tomatoes. Some of the finest in Cyrodiil." or "Undena Orethi grows some good tomatoes. Yep. They sure are good tomatoes." when asked for rumors. Others will simply joke around: "Can't say I like tomatoes. I'm sure Undena's are good, though." and "To-MAY-to. To-MAH-to. DAY-dra. DEE-dra. It's all the same to me." Undena stands around on the Gold Road because the AI marker for her tomato farm is embedded in a boulder in the hillside, rather than being located in her tomato farm. Undena is supposed to sleep in her house from midnight until 8am but her sleep package never runs. This is because her "Tomato Patch" wander package takes precedence and will always evaluate due to having no start time or duration specified. Esta página foi modificada pela última vez à(s) 02h38min de 28 de agosto de 2013.